Do not walk ahead of the slope . What forces you to walk in diagonal or zigzag, and forever (especially if it was not possible to go zigzag) must keep a safe distance, enough so that if someone falls, do not drag it to the rest group, and can be stopped or avoided and then rescued by his teammates. Raise or lower diagonal is also more relaxed, and causes less impact to the terrain and our joints. No to march in a straight line for the same reason why security must be done along diagonals. If the step is dangerous or risky, we must pass it to one, with assurance or assistance from other group members. The guide may optionally indicate to other people group where you step or the way forward from a position safe or advanced. 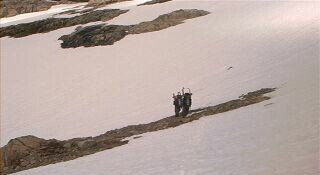 Some recommend that the Guide last drop in these cases to fulfill this function, but if there is a second guide (tail or “broom”) would not be necessary, and if the road is known only to him, or is complicated by other issues objective (cracks, snowfields that involves carving stairs, etc.). it is not possible not to be recommended.